Composed of a genuine leather exterior and heavily padded interior. Velcro fasteners around the top of the legs, and elastic straps at the bottom of the instep ensures a comfortable and secure fit. Color: BLACK .. Constructed with vinyl exterior and heavily padded interior. 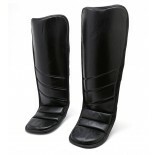 Velcro fasteners around the top of the legs, and elastic straps at the bottom of the instep ensures a secure and comfortable fit. SIZE: XS, S, M, L, XL Color: Black only .. 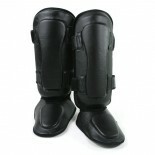 Features a genuine leather exterior and quality padded interior. 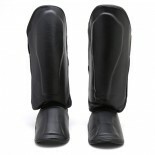 Leather shin & insteps are attached to a supple fabric that comfortably envelopes your leg and feet. Easy wear and removal. ..